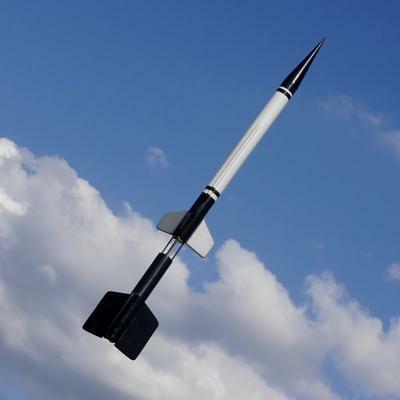 This "NAR Contest - Legal" model of America's first Sounding Rocket is nearly two feet tall. Using the "Pass - Port" staging method, a standard 18mm Booster engine fires another 18mm Upper Stage engine for sky - high flights! The Upper Stage may also be flown as a single stage model. 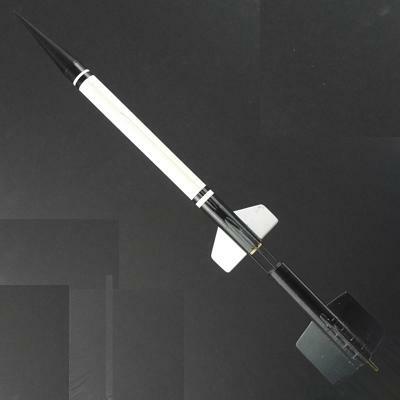 Features hard balsa nose cone and laser-cut balsa fins. Recommended for the intermediate to advanced modeler. Adhesives (thin Cyanoacrylate, “CA” glue, is recommend for some steps - for the rest of the model CA, Wood Glue, such as Elmer‘s Carpenters Glue or Titebond, or Epoxy may be used. We recommend you read “Some Notes on Adhesives”. ); wax paper; hobby knife with a sharp #11 blade; ruler; scissors; masking tape; sanding sealer (or balsa fillercoat); thinner (appropriate type for the sanding sealer); small paint brush; paint (Spray paint, such as Krylon or Testors is recommended. Be sure not to mix different types or brands of paint without testing) - primer (optional), white and/or yellow, black, silver & clear (optional); sandpaper (medium - 220 or 280, fine - 320 or 400, & [optionally] extra fine - 500 or 600); ball point or felt tip pen; pencil. Optional: material to fill body tube seams such as Elmer’s Fill & Finish, Elmer’s Professional Carpenter’s Wood Filler or interior spackling paste.